After Pakistan’s Supreme Court barred opposition leader Nawaz Sharif and his brother, Shahbaz, from holding public office on Wednesday, protests broke out across the country. Sharif, of the Pakistan Muslim League – Nawaz (PML-N) Party, blames Pakistani president and longtime rival Asif Ali Zardari for the decision. Sharif quit the coalition government in August of last year. Sharif’s supporters have taken to the streets against Zardari’s Pakistan People’s Party (PPP) — a sign of political instability and distraction even as the country deals with terrorism and the economic crisis. For more on Sharif’s position and Pakistan’s political maneuvering, see PBS Wide Angle’s interview with Pakistan expert Daniel Markey. All those who have supported one position or the other, instead of the compromise, are also guilty. This is a collective failure on our part, not just of the political players. Pakistan is straight heading for a train wreck and the biggest losers will be the (divided) civil society and democratic forces notwithstanding their heroic 60-year struggle. Politically, the Sharifs and their faction of the Muslim League (PML-N) — Pakistan’s second largest party — are isolated. Their major allies are those outside of parliament […] However, there is a huge disparity between the Zardari’s political security and popular opinion toward him. Simply put, Zardari is hated inside Pakistan, particularly in Punjab. This has always been the case, except for the burst of sympathy after his wife’s murder. Public goodwill toward Zardari dissipated by the following summer when he violated a series of popular agreements with Nawaz. 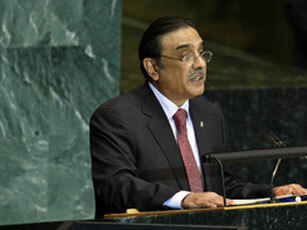 Subsequently, Zardari made a power grab and took the presidency. […]So the big question are: How long can the contradictions between Zardari’s political strength and massive unpopularity last? And can Pakistan achieve political stability with its second largest party shut out of the corridors of power? I, and my family WERE strictly PPP supporters since my grand fathers time. […] [Zardari] should have definitely not done this, as the coalition govt was a good sign of democracy in Pakistan, and PPP still had the main parts of the govt power anyway, and they should have been already satisfied with that. Should we call Pakistan, a nation of beggars as this is the only product we are producing for the last many years. Our recent factories to produce these unique product are established by two richest political groups who are governing the federal government and Punjab government respectively. They started distributing money to help poor in the society. The huge money could have been used to create jobs and let these poor work and earn living for themselves.Distributing of bicycles and sewing machines could have been a better option as these two items are still a luxury in our villages where 70% population live and can earn living with these two items. But as a nation we become beggars, what it makes different if you are sitting/ standing by the road in dirty cloths or visiting richest countries capitals in expansive outfits, you are basically BEGGING and bring your nation down in front of the one from whom you are begging. Beggars always give reason and excuses for this worst kind of behavior for a dignified person or a nation. Could we as a nation are respectful enough to stop thinking of this bagging excuses as most of the time we as a nation go and beg from nations who earned hard their fortune and was not for granted. Pray for betterment in Pakisan. Khwaja Aftab Ali,Advocate & I.P. Attorney. ( a former PRO, Iranian Embassy, Saudi Arabia) presently residing in Orlando, Florida, USA. Almighty God bless America,The USA. Most powerful man has gone and two richest persons/groups have come in power. The poor will become poorer and rich will be richer day by day because of the unique business of politics in Pakistan. President Musharraf handed over resignation to the chief of army staff in presence of other generals. Army act of Pakistan zindabad , Pakistan paindabad. For God sake, plan for creation of jobs and circulation of money to boost economy of the under developed country. And make sure the rule of law over rule the law of ruler. Hard working people of Pakistan can make this great country a wonderful place if justice is provided to the common man. All the best with lot of prayers to the Almighty GOD for the welfare of common people in Pakistan.KHWAJA AFTAB ALI,Orlando, Florida, USA.